On May 28, 2013, the Crystal Lake Conservancy was the proud recipient of Green Decade Newton's 2013 Environmental Leadership Award (in group award category) for outstanding environmental contribution in Newton. Green Decade Newton chose CLC based on our recent work to preserve the lake and increase community awareness about issues facing the lake. 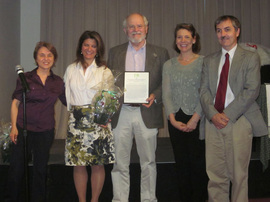 The award ceremony took place at Green Decade's “Greening our Community Series” program at the Newton Free Library. Other award recipients were State Representative Kay Khan for her work to make the Newton Lower Falls Community Center a more environmentally sustainable building and the business Big Belly Solar. You can view the award here.